That means heavy rain from storms could cause street flooding. The line of storms could also bring severe threats including high winds, hail, and possible tornadoes. The New Orleans Office of Homeland Security and Emergency Preparedness is in close communication with the National Weather Service and is monitoring severe weather. New Orleans residents are urged to stay weather aware and prepare for heavy rain and storms. Effective immediately, parking restrictions on neutral grounds and sidewalks are suspended until 10 a.m. Friday, April 5. Residents are reminded not to block intersections or streetcar tracks. During heavy rain, use caution around areas prone to significant street flooding, like streets under bridges and overpasses. As of Thursday afternoon, street flooding was reported at Uptown locations including St. Charles Avenue between Jackson and Josephine streets, Oak Street and Carrollton Avenue, the 3600 block of Octavia Street, the 8100 block of Apple Street and South Claiborne Avenue at the Interstate 10 ramp. 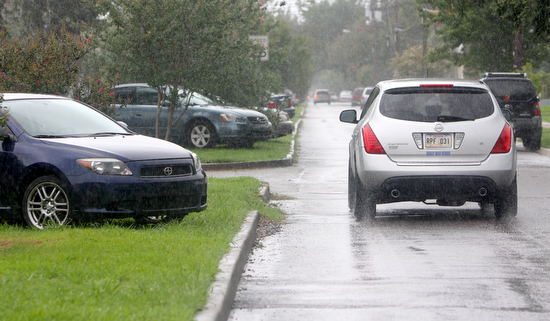 The New Orleans Police Department will ticket motorists who drive faster than 5 mph on streets with standing water. Due to the potentially severe danger that could result from high water, residents should call 911 to report street flooding and life-threatening emergencies. Reports of street flooding are shown in real time at streetwise.nola.gov.